Heat milk and butter on the stove until the butter is melted and it comes to a full boil. 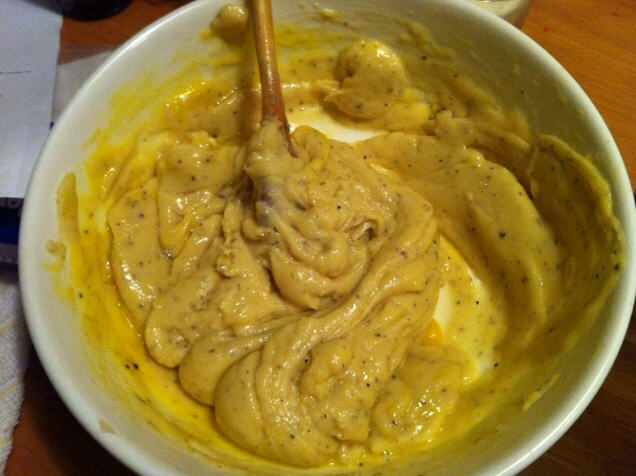 Add the flour all at once and stir vigorously until it has formed a dough. Note: the original recipe recommended I add the spices towards the end, but I got ahead of myself and added them with the flour to the liquid. No big deal. Transfer the dough to a bowl and add the eggs, one at a time. 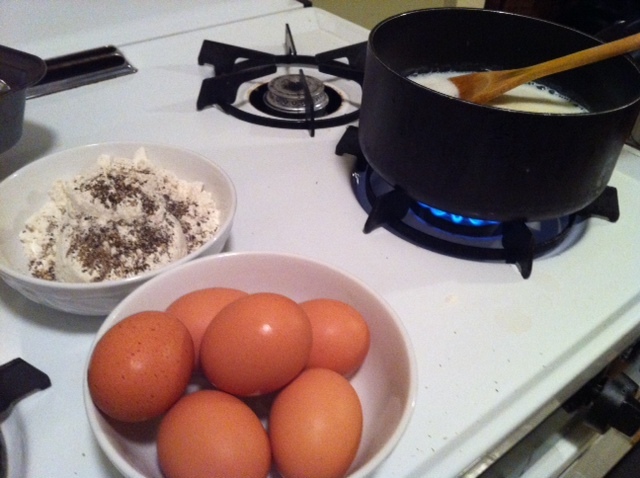 Make sure each egg is fully incorporated into the dough before adding the next one. Once all the eggs are added, use a silicone spatula to fold in the cheese. Then, put the choux pastry into a pastry bag with a larger tip, and pipe out little 2-3 inch rounds on a baking sheet lined with parchment paper. Beat the last egg and use a pastry brush to do a generous egg wash on each pastry. 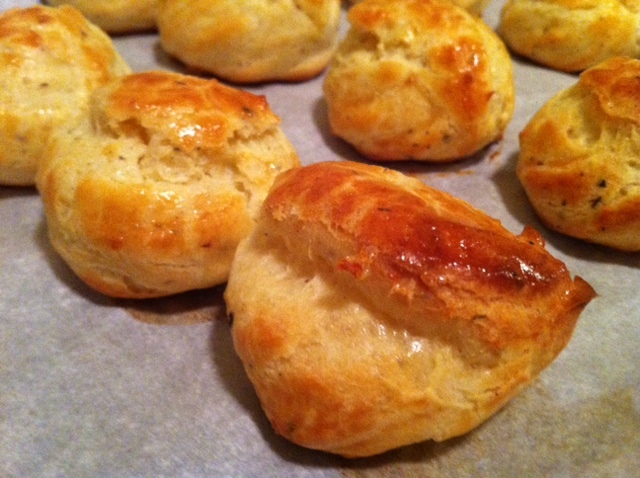 Bake at 350F for 25-35 minutes, until the gougeres are a lovely shade of golden brown. Variations: You can add all kinds of stuff to the choux, such as very finely crumbled bacon or chopped spinach. You can also pipe out larger pastries for a more hearty serving size. thanks, d! i really enjoy making these, and they're really easy. 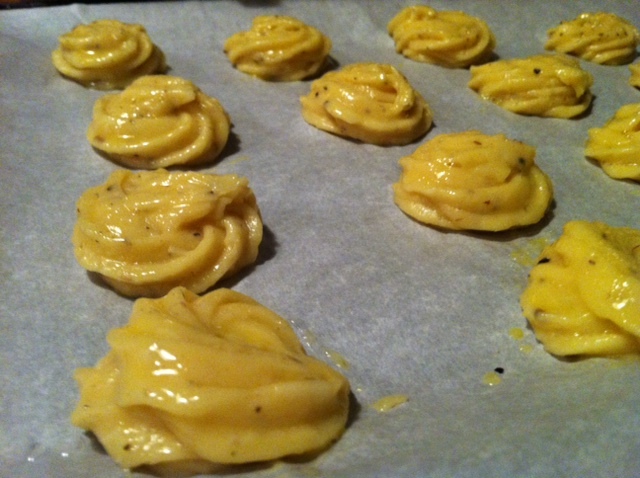 you can also omit all the savory spices and cheese, and use the pastry to make cream puffs (profiteroles).